Why has the Leaning Tower of Pisa survived the strong earthquakes that have hit the region since the middle ages? This is a long-standing question a research group of 16 engineers has investigated, including a leading expert in earthquake engineering and soil-structure interaction from the University of Bristol. 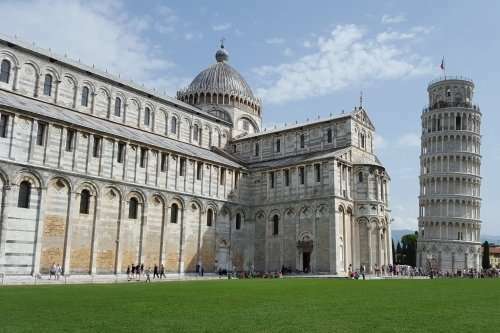 Professor George Mylonakis, from Bristol's Department of Civil Engineering, was invited to join a 16-member research team, led by Professor Camillo Nuti at Roma Tre University, to explore this Leaning Tower of Pisa mystery that has puzzled engineers for many years. Despite leaning precariously at a five-degree angle, leading to an offset at the top of over five metres, the 58-metre tall Tower has managed to survive, undamaged, at least four strong earthquakes that have hit the region since 1280. Given the vulnerability of the structure, which barely manages to stand vertically, it was expected to sustain serious damage or even collapse because of moderate seismic activity. Surprisingly this hasn't happened, and this has mystified engineers for a long time. After studying available seismological, geotechnical and structural information, the research team concluded that the survival of the Tower can be attributed to a phenomenon known as dynamic soil-structure interaction (DSSI). The considerable height and stiffness of the Tower combined with the softness of the foundation soil, causes the vibrational characteristics of the structure to be modified substantially, in such a way that the Tower does not resonate with earthquake ground motion. This has been the key to its survival. The unique combination of these characteristics gives the Tower of Pisa the world record in DSSI effects. Professor Mylonakis, Chair in Geotechnics and Soil-Structure Interaction, and Head of Earthquake and Geotechnical Engineering Research Group in the Department of Civil Engineering at the University of Bristol, said: "Ironically, the very same soil that caused the leaning instability and brought the Tower to the verge of collapse, can be credited for helping it survive these seismic events."